One of Australia’s most decorated PUBG teams is looking to put the region on the map at the biggest event so far in 2019. Incognito managed to defy the odds to make it to London. Coming from over 40 points behind heading into the final day, they got over their rivals Athletico by eight points to qualify for their second international event. Led by Nathan “Ykikamucow” Lynham, the core of Jesse “Insight” Spencer, Jordan “Jouxy” de Joux, and Matt “Ronon” Lee have stuck together over the last 12 months to dominate the Oceanic PUBG scene alongside Athletico. Getting to London has been a challenge for the team, however. Without support from an organization, they’ve looked toward crowdfunding for a boot camp before the FACEIT Global Summit to give them the best chance of doing their region proud. 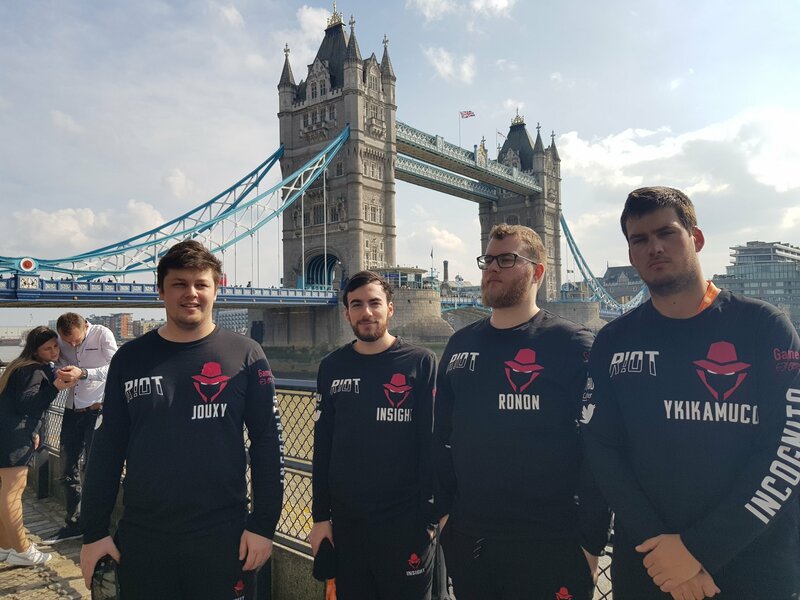 With a chance to test themselves against the world’s best, Incognito talked to Dot Esports about the journey to London and their hopes for the biggest tournament they’ve attended. How was the trip over to London? Insight: Terrible and insanely long. It was like 24 hours. Ronon: If you count when I left my apartment to when we got to our Airbnb, it would have been about 38 hours. Now, you guys were behind Athletico by 40 points heading into the final day of the qualifiers. How did you manage to claw that back? Ronon: Athletico is a team that really struggles when they aren’t four-men strong, so in the first game of the night, we cheesed them to get into their heads early on. They were in front of us by about 40 points heading into the final six games, so Ronan and Insight thought up a little plan to get some early kills onto them. Insight: That was easily the best game of the tournament for us and really set the tone for the rest of the night. Did you feel the desperation? Ykikamucow: Yeah definitely we did. When there’s only one spot and you are 40 points behind the leaders, the pressure does get to you. We always thought that the gap was like 20 points, and that was pretty catchable, but with 40 points, we had to do something right off the bat or Athletico would get too far in front. Jouxy: The week going into that was one of the most stressful weeks of my life. It’s such a long wait for two days to determine whether you were going to London or staying at home. Ronon: We just had to do everything we could to beat Athletico. Forty points was a massive lead and we were getting pretty desperate, especially after a rough second week where we got a massive lead and threw it all away on night four. Insight: We had a night in the first week where we made up a 60-point gap, so while we knew it was tough, it was still doable. What do you guys think about the new points system? Do you think it’s good or bad for the game? Ronon: I think it’s good to a certain extent, but there’s a few minor adjustments it needs. Specifically, we’ve watched a lot of PEL and you see toward the endgame a lot of teams denying points by suiciding, which from an esports viewership perspective isn’t what the fans want to see. You want to see people go for the one-vs-two, not just dying to the blue—as a fan, you want to see a player clutch up, not just run into the blue when the situation is too tough. The points system overall is great, though. How would you go about that? Would you possibly take away points for suicides? Ronon: Yeah, possibly, that could work, but it might be a bit too extreme. Maybe you can just give the points to the team regardless, but that’s hard. Insight: It’s going to be difficult, but they’ll figure something out. Losing a point for a suicide is hard to implement, though, because you’d have to draw the line between an intentional suicide and a misplay. Ykikamucow: Another argument is that there are two teams left and it’s a one-vs-four but they don’t realize how many teams are left so they run into the blue and die and say “well I thought there were more teams.” There’s a lot of problems that could come from something like that, but there’s something that needs to be done. Overall, though, the points system has been better for the viewers because it encourages a lot more fighting through all zones, not just at the end. Jouxy: It encourages a lot of different playstyles, too. If you want to be an aggressive team from the start, you can make it work with less risk compared to the previous point system. That definitely applies to us—we were a top five team before, but the new points system has allowed us to push into the top two. Last time you guys played internationally, you took home the Omen by HP Invitational. But expectations this time around would be lower. What are you hoping to prove at the Global Summit? Ykikamucow: Honestly, the biggest thing for us is to prove our region is good enough. We aren’t discounting ourselves from a big finish yet, but if we get a top three placement, that’ll be huge for Oceania as that means an extra slot for PGI for the region. It’s a full-on goal, but we’ve been doing our study and we are confident we can make it. Incognito has had a pretty stable roster over the last six months compared to other teams in the region. Do you think that helped you across the line? Ykikamucow: It definitely has. When we first joined up, we were known as a hard fragging team even in the old meta, but now that everyone has adjusted to playing with each other, we’ve got a headstart on other rosters. Everyone else has had to try and adjust to the new meta but we’ve managed to mesh really quickly thanks to that synergy. Jouxy: We also don’t need to take a couple of weeks to get a new person on the same page. We can use that time to develop new strategies and iron out our issues. You’ll be facing some heavyweight teams at the Global Summit, but who are you looking forward to playing the most? Ykikamucow: I don’t know. ENCE has shown up massively at PEL and smashed the competition. That’ll be so exciting to come up against ENCE and have a massive fight against them. Jouxy: Liquid would also be the cliche answer, too. I’m also interested to see how we will do against the NA teams. I feel like we are equally as sharp as a lot of the teams, but it’ll come down to LAN experience and being composed at the tournament. All the other regions have their pro leagues which require them to play on LAN, whereas we have a three-week online tournament. We will be able to take the LAN experience we get from here and take it home, though, which will be great for the region. Looking sharp before media day for @FACEITPUBG with our FaceIt wrangler Harley! You were playing under the Order banner up until the start of this year before returning to Incognito. Without the org support, you guys ran a crowdfunding campaign to organize a boot camp before the major. How successful was that? Ykikamucow: It’s been super successful for us. We wanted to fit in a boot camp before the major, so we needed to find the money to upfront the cost of a few days practice, Airbnbs, food, and other day-to-day stuff. Ultimately, we’re probably one of the more loved teams in Oceania and that’s really shown through with the interest in the crowdfunding, especially in the cheaper Bronze and Silver package. However, some members of the community have really stepped up to support us on our journey to London. People like Dale from R!OT Gaming, Funky, and Game On Aus have generously given a lot of support through the higher tiers, but it’s been a massive community effort. It just went perfectly. We stayed at House of Gamers in Birmingham who booked us out a space and treated us nicely, and we feel prepared for the battle ahead. You can catch Incognito battle it out at the FACEIT Global Summit in London starting on April 16 on Twitch.